Advertising is part of our world. It has been around for hundreds of years, and it comes in a variety of formats ranging from bumper stickers to billboards. It also includes newspaper ads, direct mail postcards, outdoor billboards and wall art. 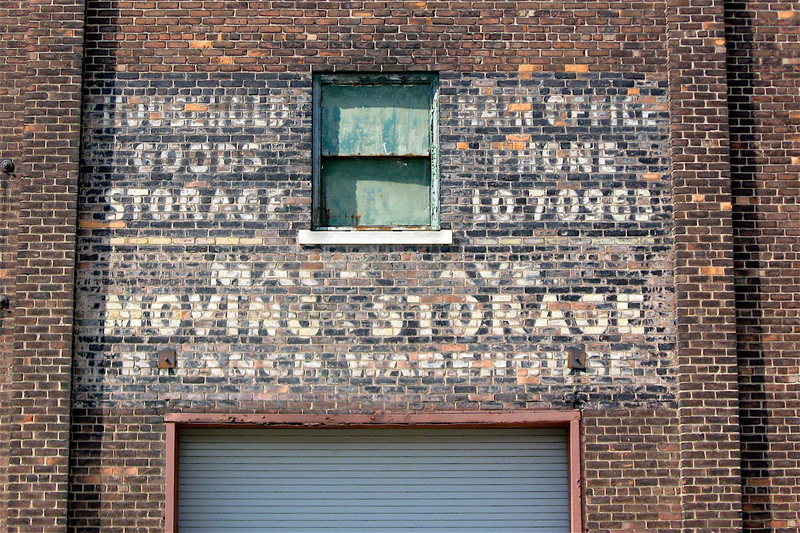 Many of the wall ads I see while riding in Detroit promote everything from fresh BBQ ribs to the city’s best pawn shop. While some may highlight the lowest priced liquor, another may feature various female hair products. 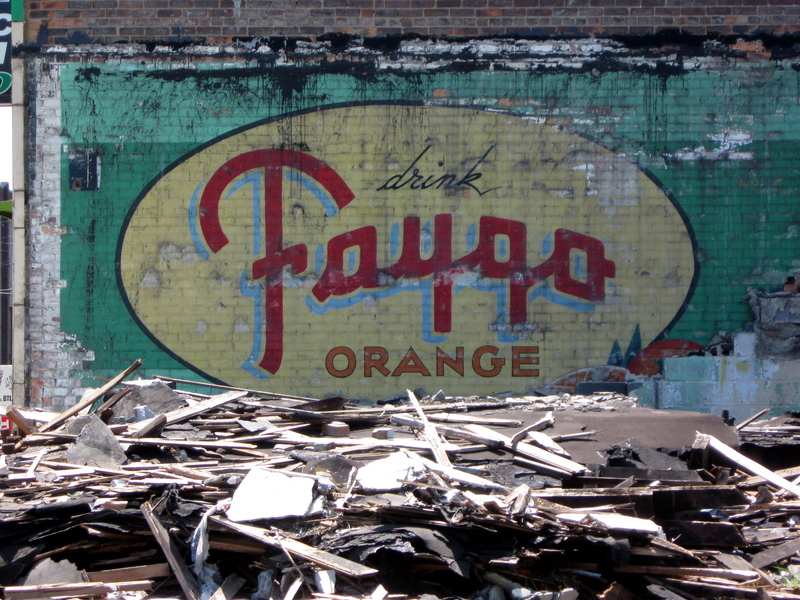 Most can found on the walls of many of Detroit’s commercial buildings painted in bright, colorful eye-catching tones. There is another group of wall ads I see on my rides that I like to call faders. 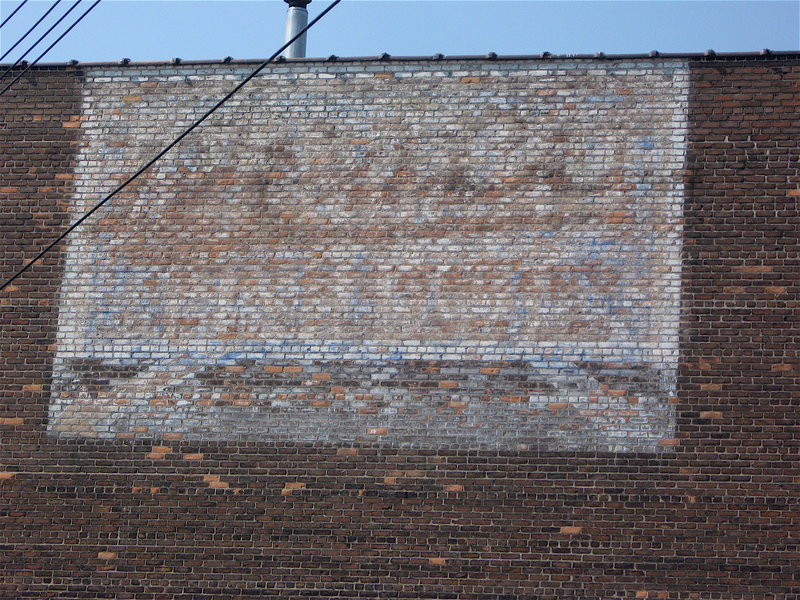 They are ads that have been painted on the sides of the city’s older, 2-story brick buildings decades ago. Sadly, they are now slowly fading, much like a friendly ghost in a children’s story. Many of the best faders I’ve spotted appear to have been painted on the buildings shortly after they were built, often close to a hundred years ago. They feature free-flowing curved lines, interesting old-fashioned letter styles, and from what I could make out, subtle pastel colors. They remind me of an ornate ad that can be found in The Old Farmer’s Almanac, and they are in sharp contrast to the bold colors and heavy block type letters that seem to be the norm today. Many of the faders were hidden by adjoining structures that butted up against the buildings they were painted on. 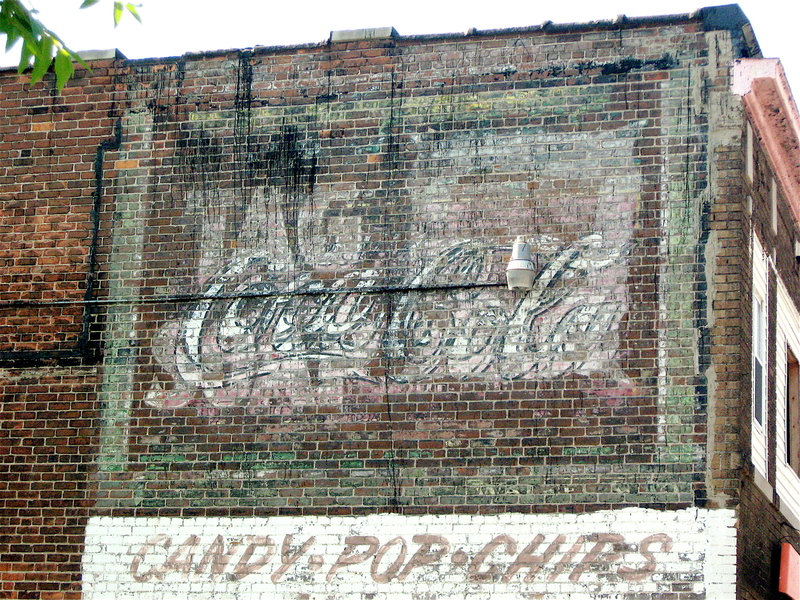 Since then, the adjacent buildings have been torn down, exposing the vintage ads. Others have come into view because wall coverings (such as stucco, billboard frames, and wood coverings applied years ago) hid them from sight. 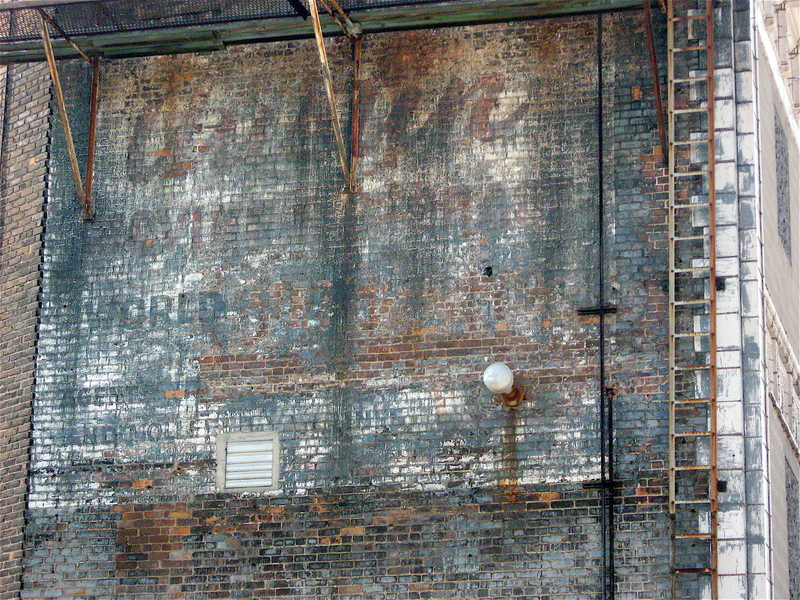 As the coverings have deteriorated over time, the graceful old ads have been exposed. Time has taken its toll on most of the faders. Many have lost 90% of their color and decorative graphics, making them nearly impossible to read. Those that have survived years of rain, sleet and blinding sunshine are gently fading away, like colorful October leaves that slowly drop and fade into the ground below. I guess everything has a life cycle, including faders and their historical significance to Detroit’s early commerce. It’s unfortunate, but they too will soon be lost forever. 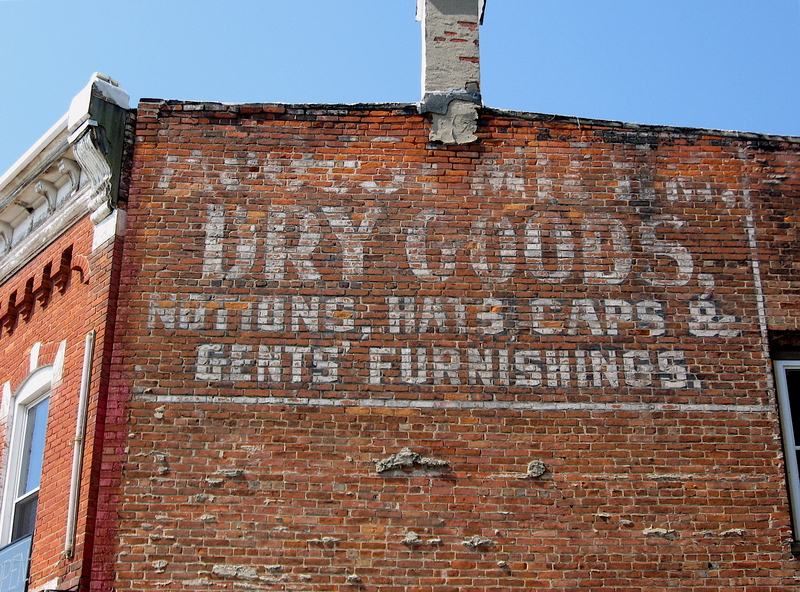 Here are links to other entries on the Fading Wall Signs of Detroit. 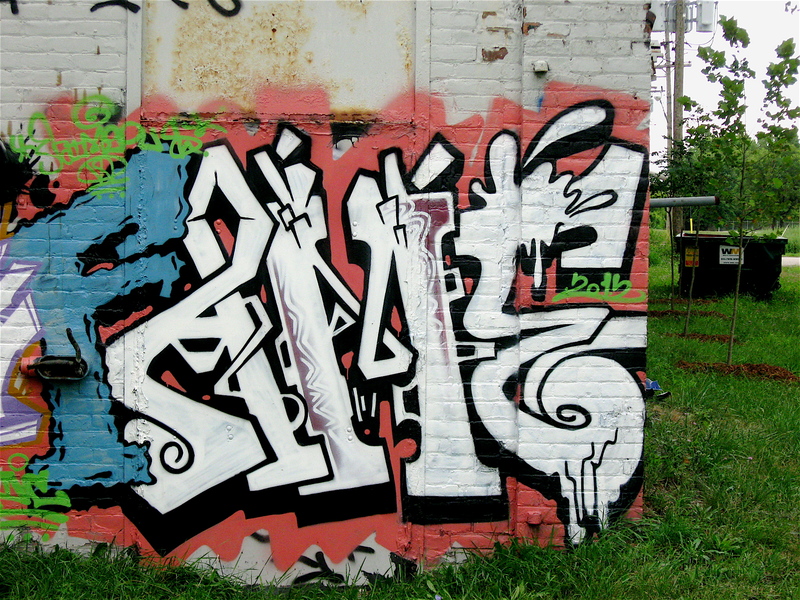 As I’ve written in the past, Detroit is jam-packed with all types of graffiti. 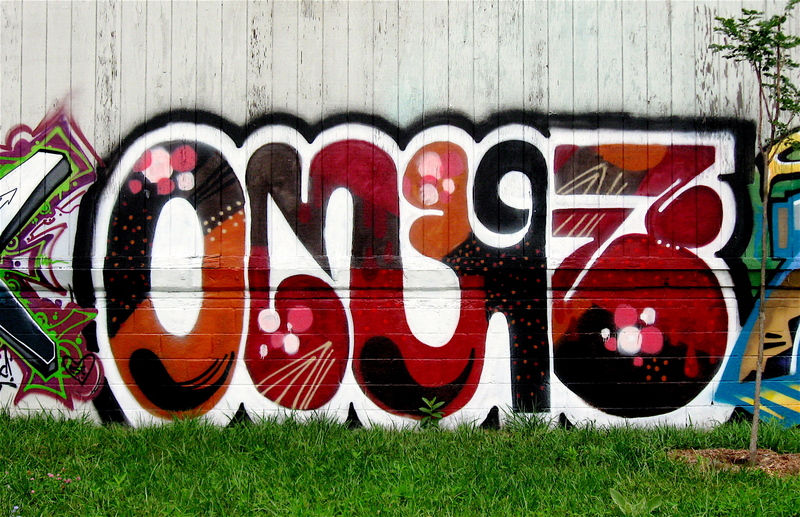 There are pieces featuring free-flowing, highly stylized letters. Others consist of sinister and eerie looking caricatures with droopy eyes, contorted facial features and wild, eye-catching bright colors. 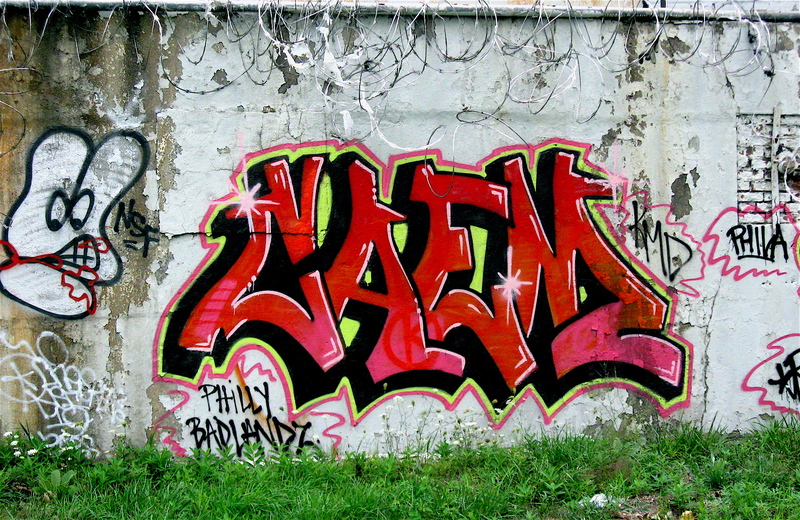 Graffiti artist names such as Yogert, Kosher, Dems and others, all painted in graceful flowing lettering, can be found on walls throughout the city. Large multi-dimensional masterpieces, with intricate interlocking letters, winding arrows, and crisp curvy lines, have become a major part of the mix. 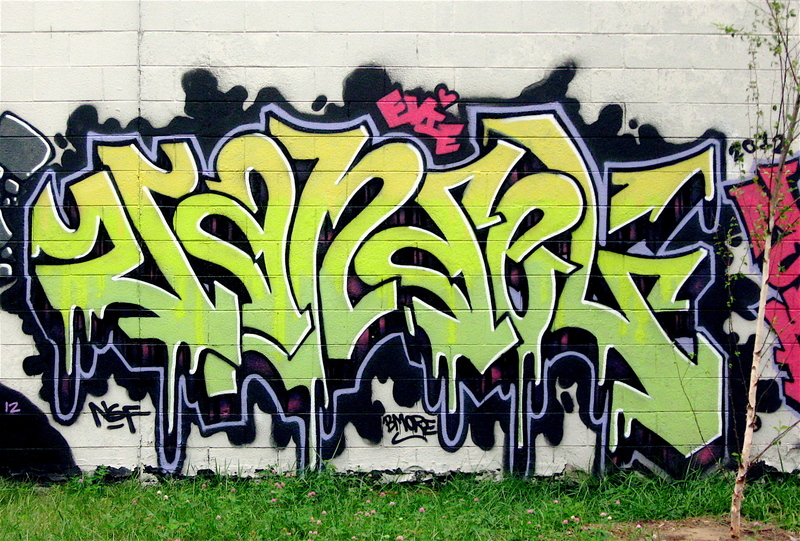 Many of the larger and more complex graffiti art can be seen along the Dequindre Cut near downtown or at major outdoor graffiti galleries, such as the one near the intersection of Grand River and East Warren Avenues. 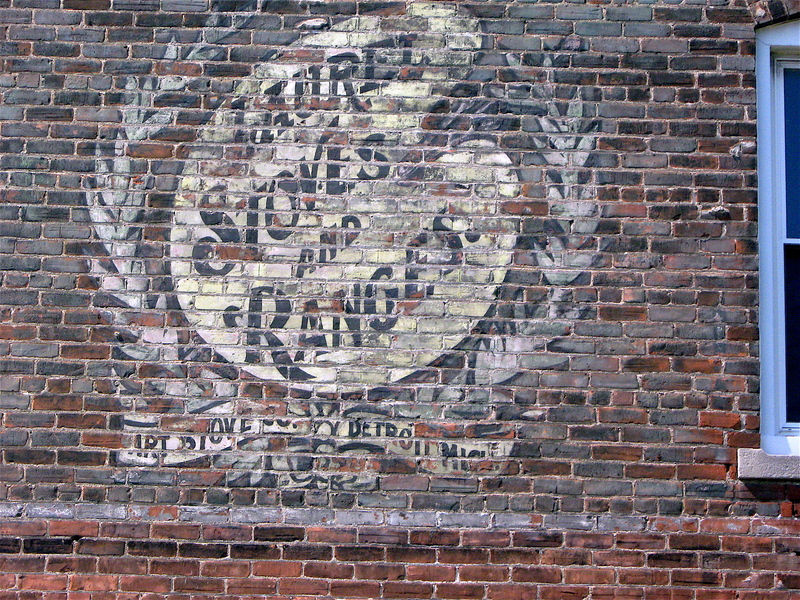 Numerous buildings in the historic Eastern Market area have become a hot-spot for colorful wall art, as have many of the city’s abandoned factories and commercial buildings. 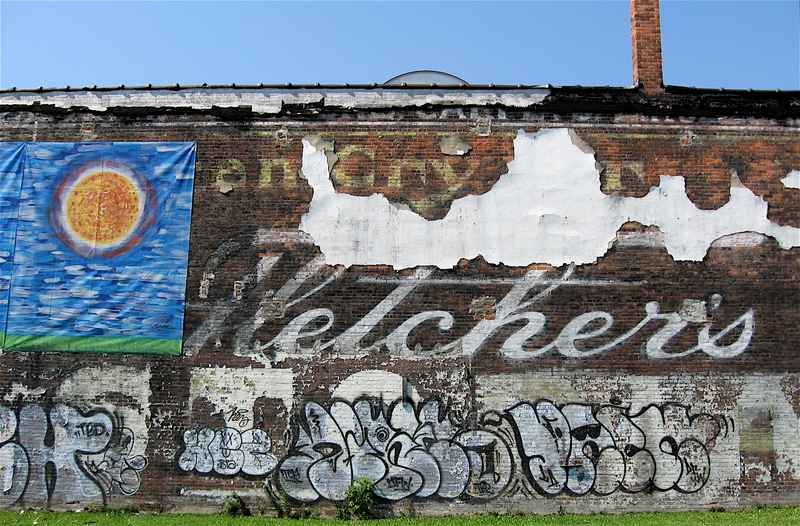 Large masterpieces can be spotted on buildings lining railroad tracks that crisscross the city, under roadway over passes and on the walls of abandoned factories such as the massive Packard Plant. There are plenty of major graffiti sites in Detroit, including a new outdoor gallery that showcases over fifty stunning compositions. 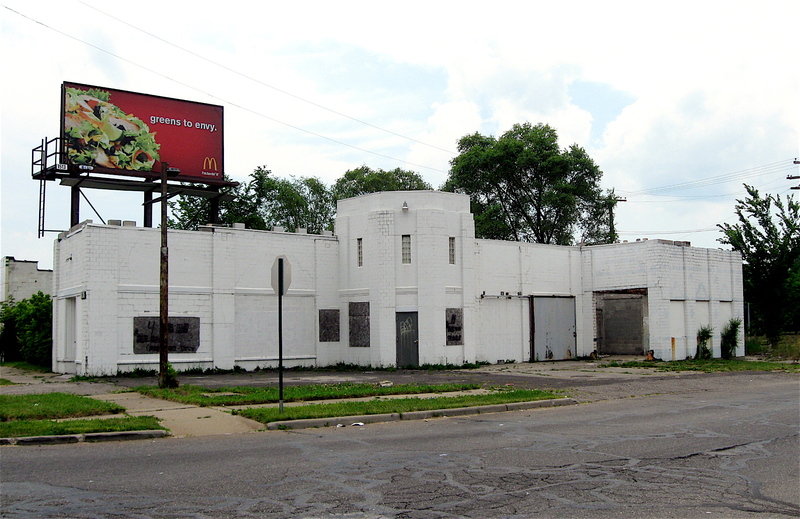 The gallery is on a commercial building that spans a full city block along Beaufait Street, between Charlevoix Street and East Vernor Highway on Detroit’s eastside. 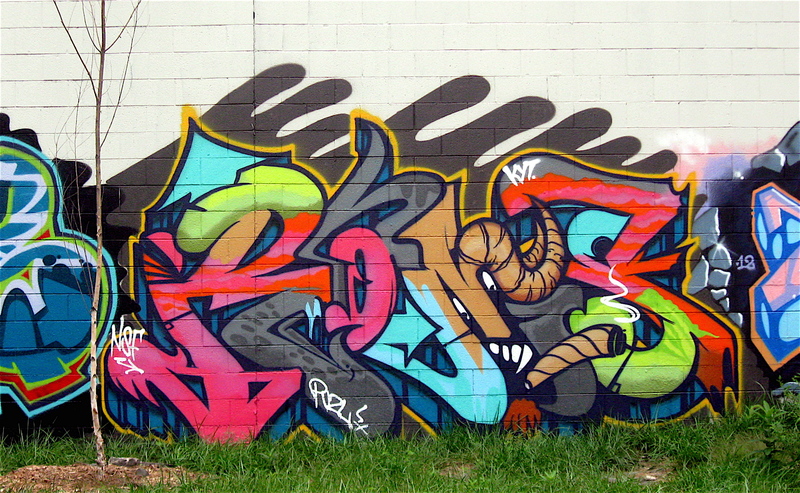 Painted on that expansive wall is an incredible variety of graffiti styles, created by some of the city’s best street artists. 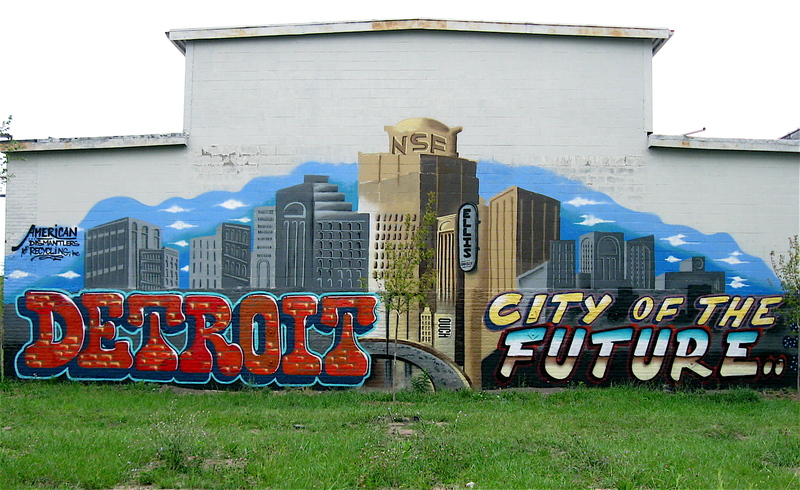 The wide-ranging wall art is anchored by a beautiful mural entitled “Detroit City of The Future”. From what I understand, the bold and colorful graffiti art was commissioned by the Ellis family, owners of the block long building. 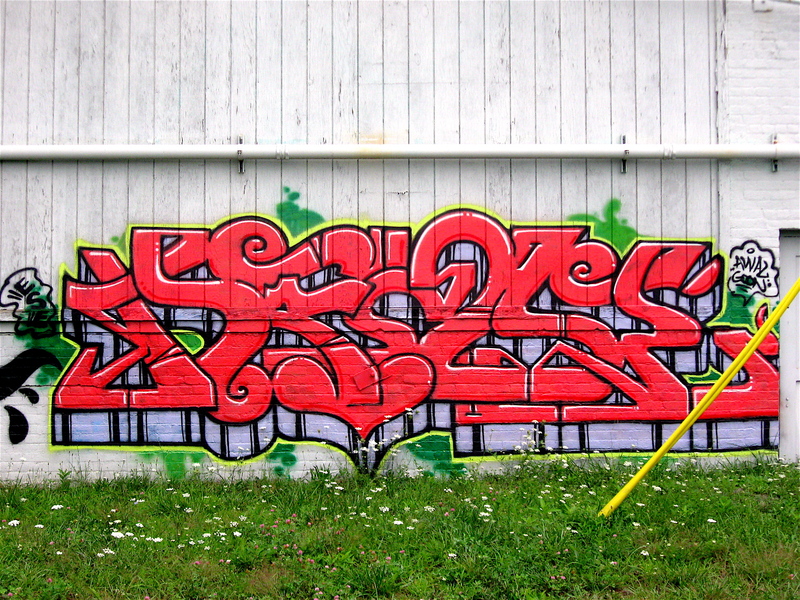 Like many of the graffiti wall art I see on my bike rides, many of the fifty plus pieces of work at the Beaufait St. site are hard to read. Letters are buried within the hard-edged designs and some of the artist’s trademark images and patterns are hard to recognize in the colorful schemes. The photos below are a sampling of what can be seen at the outdoor gallery (a site I highly recommend visiting). If anyone can name the artist or the artist’s work in photos, please post the information in the comments section. 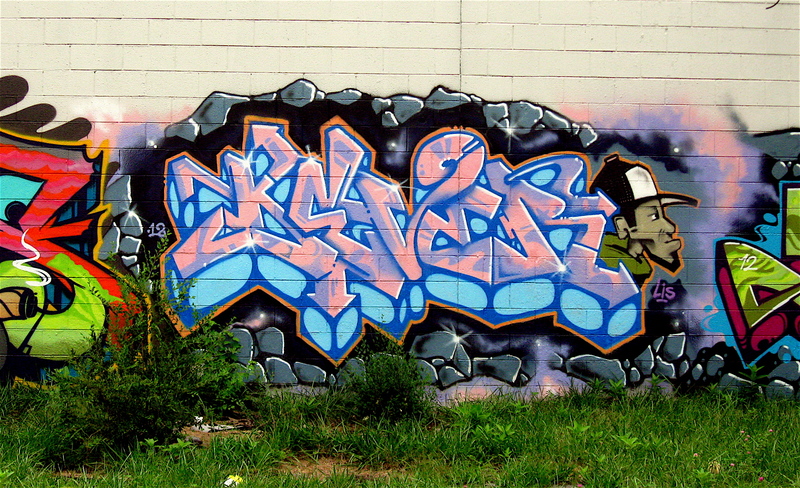 In the meantime, don’t overlook the remarkable detail and artistry of the graffiti art found within the pictures. Detroit is an odd place at times. It is full of funny signs, quirky streets, unusual people and colorful, bizarre buildings. The more I ride my bike throughout the City of Detroit, the more I have to shake my head in disbelief at what I see while thinking to myself, “What the hell is that?” Such was the case a few weeks ago when I stumbled upon a heap of painted dirt. 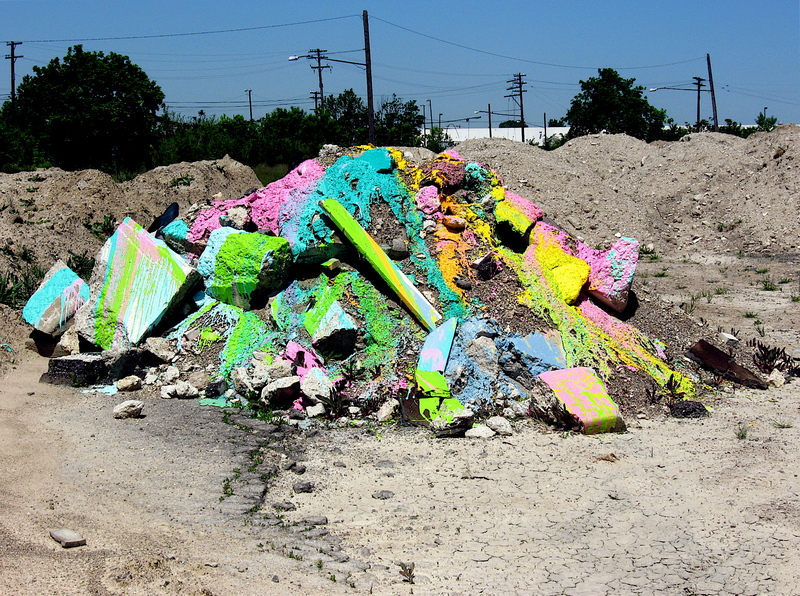 Yes, a pile of multi-colored pastel painted dirt. I discovered the painted mound while revisiting an abandoned playground in a middle of a field; a field I presume where a school may once have been. When I first spotted the playground a couple of summers ago, I was struck by its subtle beauty, partly because of its isolated location. The streets leading to it have been barricaded and the area surrounding it, like many other parcels of vacant land in Detroit I often see, have become a beautiful, wind-blown grassland. While exploring that tiny island of overgrown green space in the heart of the city, I felt a sense of calmness and peacefulness. It was as if I could hear the high-pitched voices and laughter of excited kids running and laughing. The playground had a cement slab in the middle, and at that time, it was marked with basketball court lines. There were also basketball rims mounted on metal poles still in place. They anchored both ends of the court. A few remnants of brightly colored, children-sized plastic playground equipment, that looked to be in fair condition, were in a section just off the court. There was nothing else but open land and tall grass all around. On my latest visit to the site I noticed big changes. The basketball hoops and poles were gone. The poles had been cut off and removed, probably the work of metal scrappers. 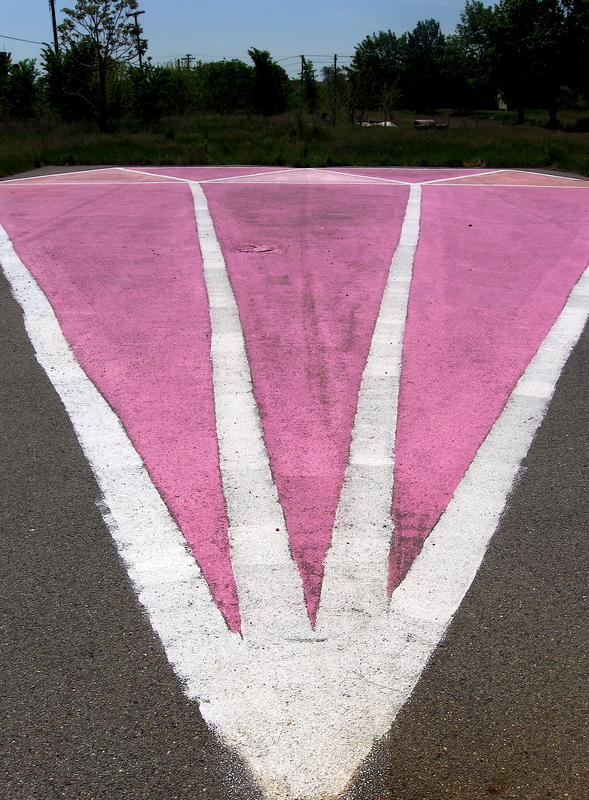 Surprisingly, there was an arrow-head design painted on the court in a pastel-red shade, with white stripes and diamonds running through. 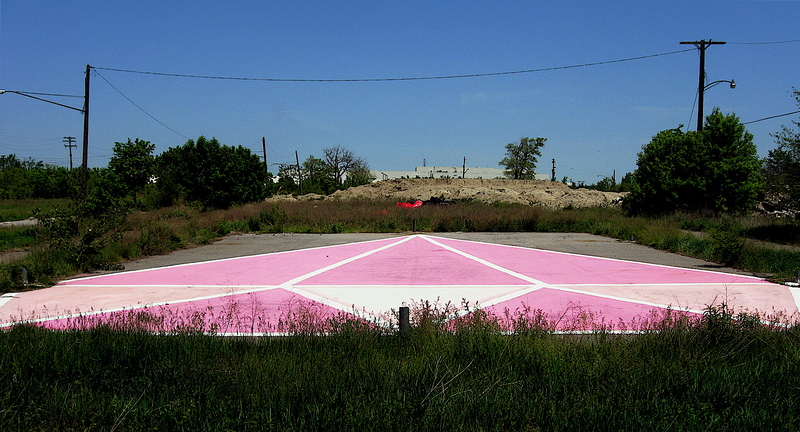 It was similar to something one might see on an airport landing strip. The small playground equipment was destroyed and the once open fields to the north are now piled with dirt. It was as if it were in a holding zone for some sort of construction project. 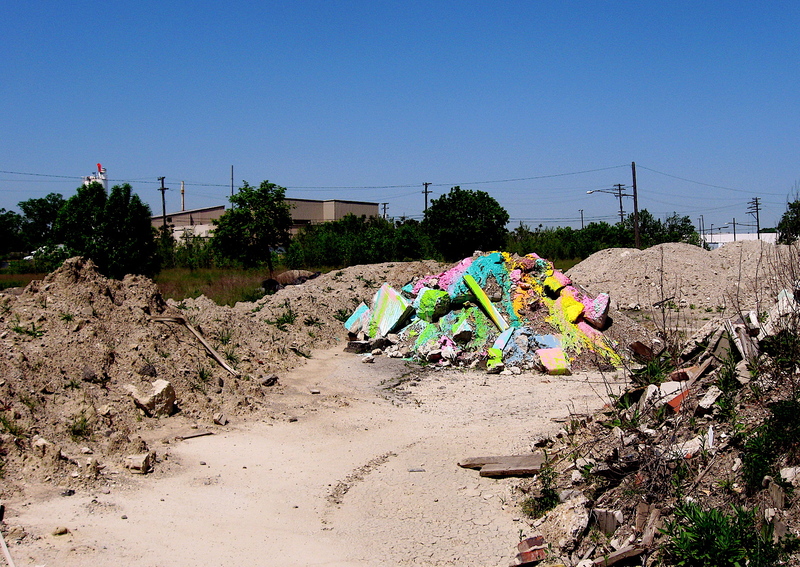 It was there, amongst the many piles of dirt and cement debris, I spotted the painted dirt. At first glance I saw a little spot of bright blue and I thought it was trash mixed within the sand colored mound. Taking a closer look I could see other colors. So I rode over for a better look and was amazed at the array of colorful hues I saw. There was an unusual mixture of bright blues and greens, bold yellows, and subtle pinkish pastels. This didn’t appear to be random paint dumped in an abandoned field. It looked as if it was done by design. I can only speculate, but I’m thinking it was the work of a street artist, and that artist painted both the basketball court and the colorful pile of dirt and debris. Frequently, I take advantage of the early sunrise by riding out to Detroit’s gem of a park, Belle Isle. 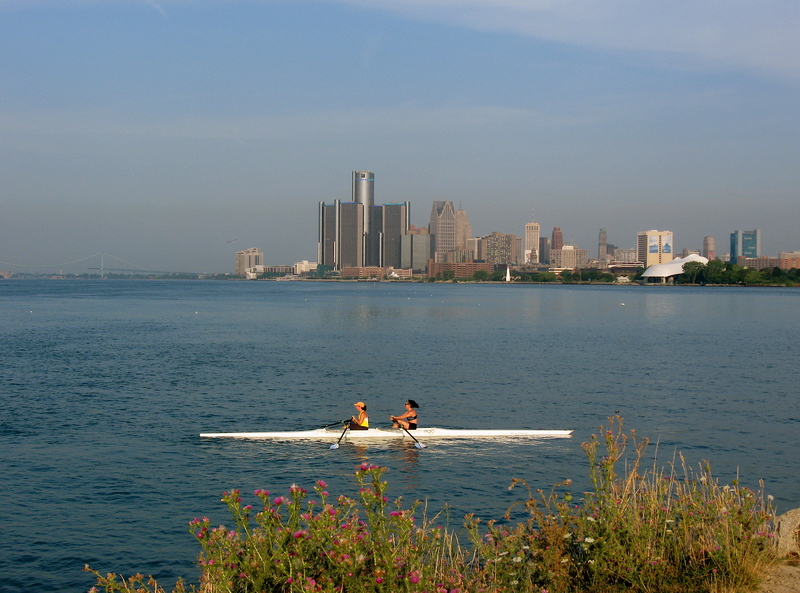 The large island park is centrally located in the middle of the Detroit River and is generally packed with thousands of people on hot, summer afternoons. But in the early morning it is quite calm. There are few picnickers, smoking barbeques are noticeably absent, and loud music rolling out of the small picnic sheds is non-existent. Thankfully, there isn’t the bumper-to-bumper traffic that slowly cruises the five-mile loop around the island, with bone-shaking music blasting, as is normally the case on warm weather afternoons. The early morning calmness is refreshing and soothing. It’s as if the island hasn’t awakened from its nightly rest. Biking across the half-mile bridge on those crystal clear mornings, with the rising eastern sun lighting the Detroit skyline, is an invigorating ride. The tall downtown buildings seem to take on a golden, reddish glow, as does the Ambassador Bridge that spans the Detroit River to Canada, just beyond downtown. The river itself appears to be a much brighter blue in the morning and is generally smooth as glass. Once on Belle Isle, it’s common to see other bike riders or groups of riders circling the outer island. Numerous joggers and a few walkers (some with dogs) are also out there enjoying the peacefulness of the early morning hours. 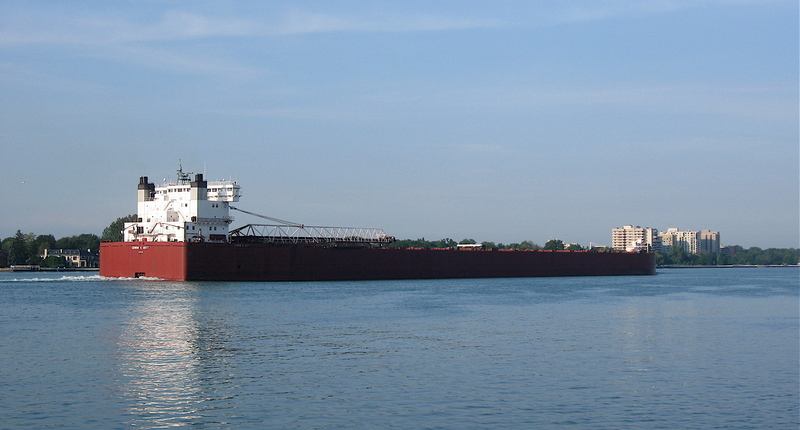 Others are out there at their special spot, sitting and relaxing in lawn chairs or on blankets, watching massive thousand-foot ore carriers as they silently slide by, like bats in the twilight sky. I cherish the serenity of the island in those early morning hours where, on occasion, I see herons and swans in the inner ponds. I’ve also spotted wild turkeys on the side of the roads, and there are always plenty of ducks and geese. The river itself is always soothing to me. 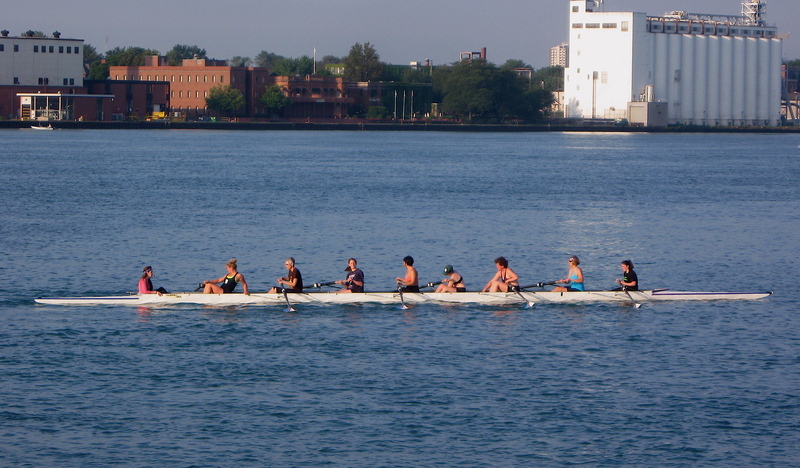 I especially like watching the Detroit Boat Club Crew members pulling on the oars of their sleek rowing boats as they effortlessly glide across the ripple-free water. The calmness I feel out there as I ride along the edge Detroit River is the perfect counter balance to the harsh realities of the city. 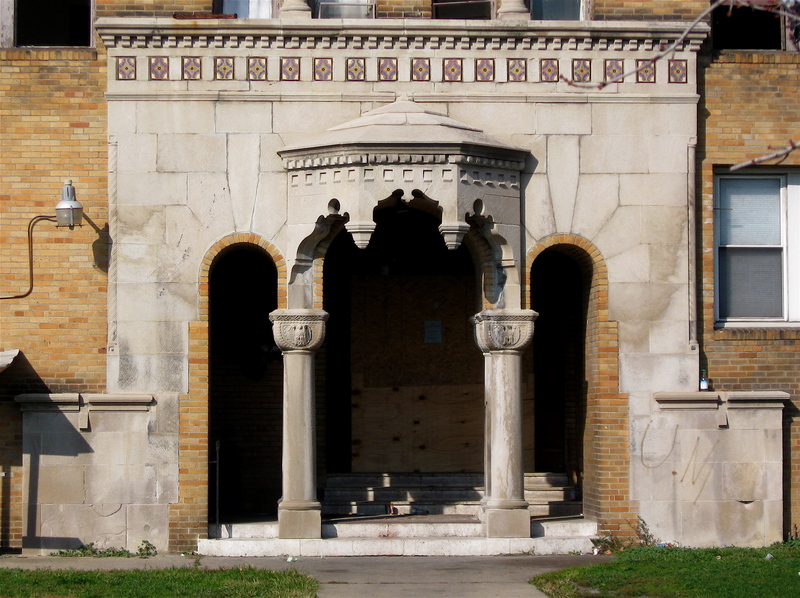 Detroit was once a boomtown. In 1920 there were about 993,000 people living in the city. By 1940 the population had nearly doubled to 1,623,000 people, an incredible increase in such a short period of time. Fast growth came with expansion, and that meant plenty of new schools, homes, and business such as gas stations, movie theaters, hardware stores, etc. These had to be built to accommodate the influx of people. That period was also a time when many of the city’s tall skyscrapers were constructed, including two of the most famous from that period: The Guardian and Penobscot, both designed in the ornate Art Deco architectural style. 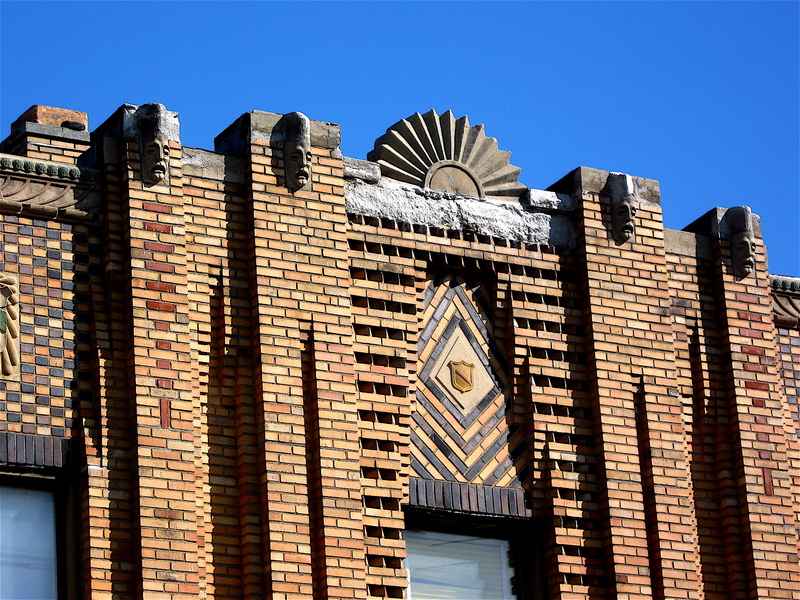 The Art Deco style can be defined by its unique brickwork and sharply defined zigzag designs made of colorful Pewabic tile. 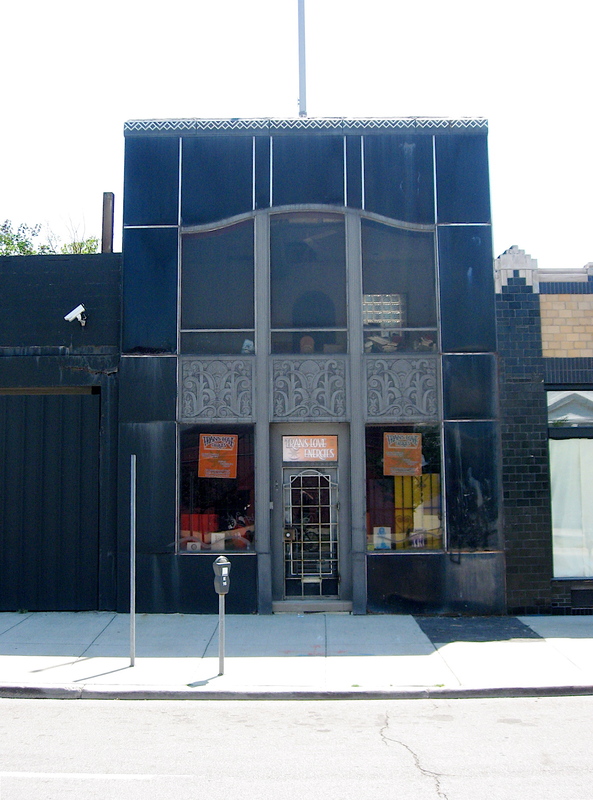 It also features Terra-cotta facades and unusual door openings that remind me of an entrance to an ancient tomb. It was at its peak during the 1930s and 1940s. 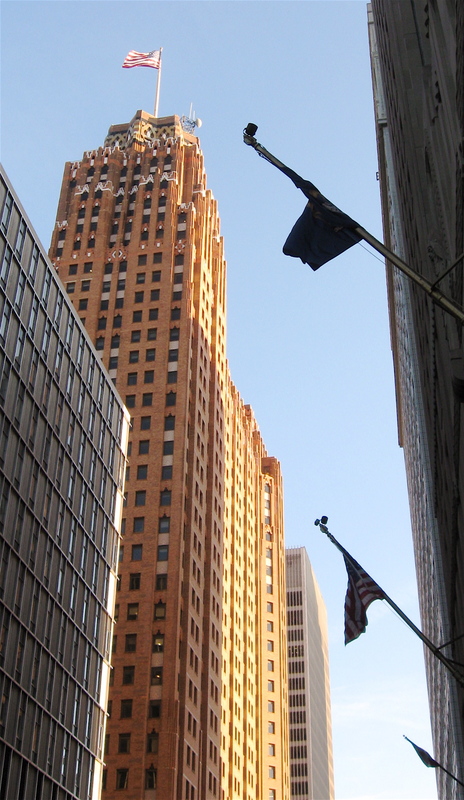 However, the Deco style was not limited to the tall buildings of downtown Detroit. 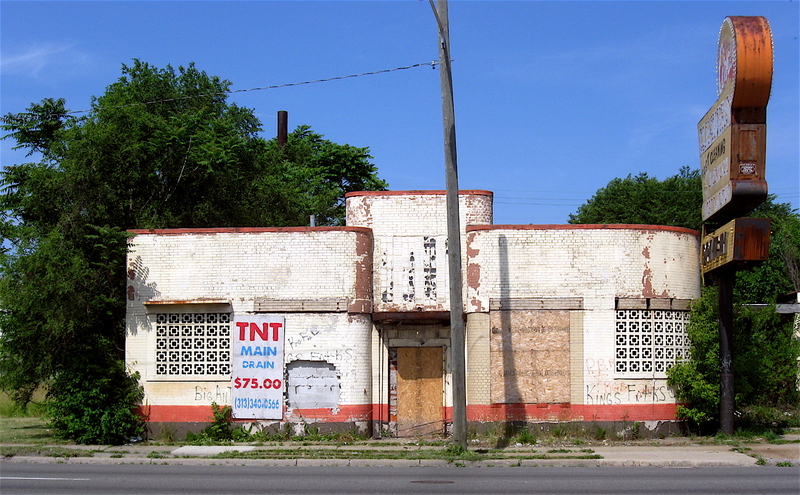 Many of the smaller single and two-story commercial buildings could be found along any of the city’s major roads. 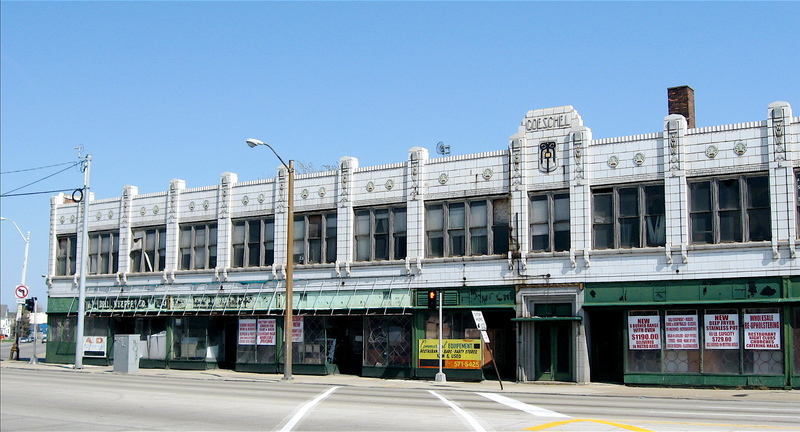 Gratiot Avenue, Grand River, Michigan Avenue and others had buildings constructed in the same style. 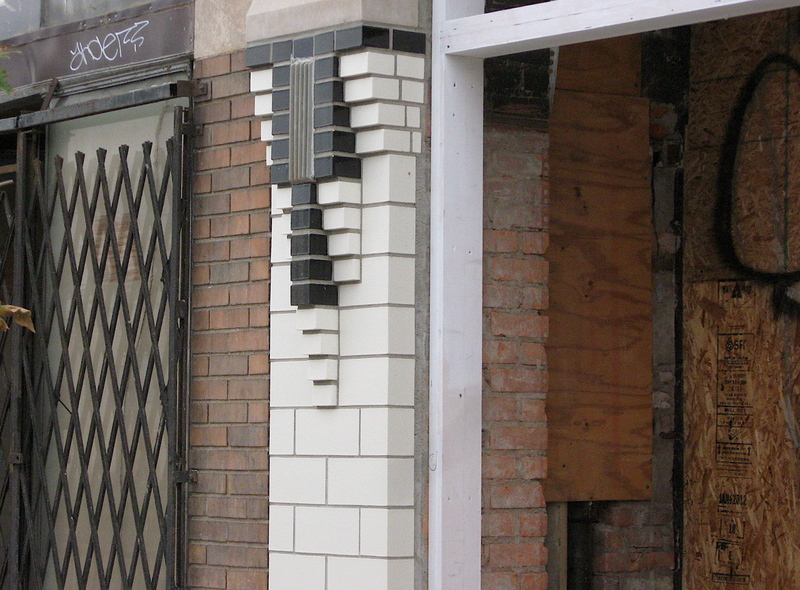 They, too, featured flowing, rounded brickwork; colorful, elaborate highlights; and other sleek design elements of the era. In some cases, a few of these smaller 1930 classics have been restored, but unfortunately, many haven’t, leading to deterioration through abandonment. 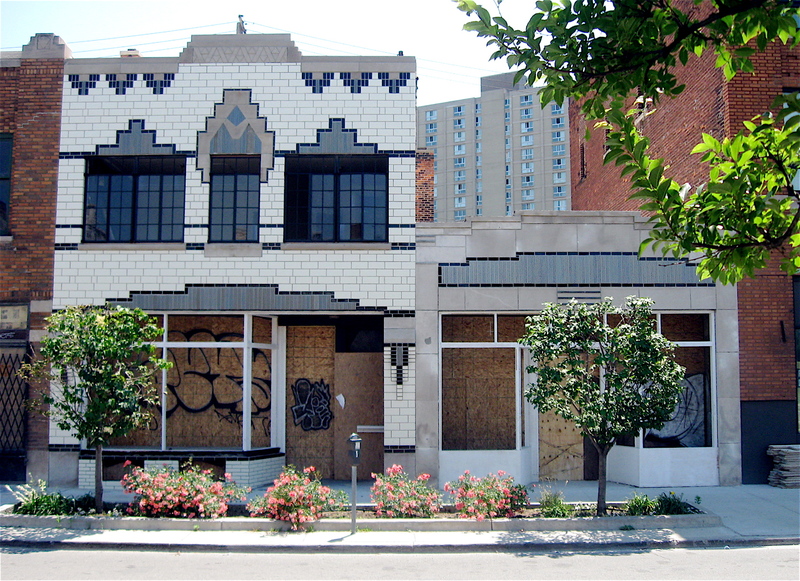 Others have been “updated” and “modernized” over time, losing much of their charm. During this period of change, most of the Deco elements such as the decorative tile, ornamental three dimensional sculpted reliefs, geometric patterns, and other highlights have been lost. Riding past these little gems and looking past the changes the buildings have gone through, it is quite easy to see the overall integrity of the design and slick lines of the structures are still in place.